So I was trying to come up with the list of the nazgul that's I've known throughout the game or can think of. Could anyone look at the list and correct me if I am wrong here, I was only able to come up with 8 out of the 9. 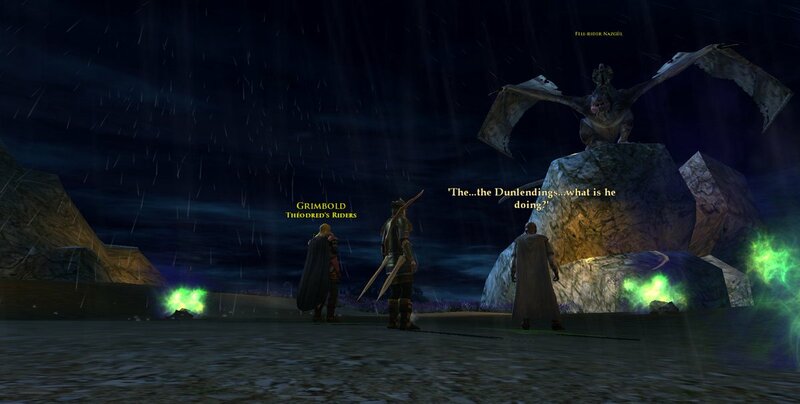 I'm not sure if some of these enemies are just powerful cargul like mordorith or not. The Grim Southron is found menacing The Wold and The East Wall in East Rohan. The ninth is a hobbit named Fogo Fallohide that haunts the Shire at night threatening to take over the Shire! It somehow always felt weird to me that Turbine decided to have 2 nazguls originated from Rhun ( Easterlings ). I hope nazgul situation will get a bit more clarified before or during the battle of the black gate. I met him among the pig sties of Budgeford and ran screaming in horror all the way to Stock in search of a few pints at the Golden Perch to steady my nerves! There's two from Harad as well: The Grim Southron and the High Sorcerer of Harad. Rhun and Harad aren't singular countries, but whole regions with many diverse peoples. We see three different tribes of Easterlings in the game, the Khundolar, Suhalar, and Jangovar. There's also a Nazgul in Bingo Boffin week 41, but I can't remember if there is a clue to which Nazgul it is. Ah so the Reaver of Khand, whom we see in the attack on Langhold, is actually The Woe of Khand? Or is it the Grim Southron? Are yall gonna be changing that name in game? Also, any chance we'll see a boss battle against the Grim Southron and the Bane of Rhun come Mordor? Yes, the old Reaver needs to be changed to the Woe. When it came time to name one of the last ones we revealed (the Forsaken Reaver), we ended up having to ret-con that name as the Forsaken Reaver's original name didn't quite fit. So how do you guys come up with these names? Since only two of them mentioned in Tolkien lore. The second in Khamul, is not even mentioned in the game so far? Why leave the only other mentioned one out? Or not refer to him by name? The name Khamul is only referenced in the posthumously publish Unfinished Tales, which no one has rights to but the Tolkien Estate. LotRO can only include content from the books published during Tolkien's lifetime, ie, The Hobbit and The Lord of the Rings, as he sold the rights to those. He would later regret doing so, so his son has refused to sell the rights to any other material. there's also the un-specified, Fell-Rider Nazgul, in the Heathfells at Dol Baran. I wonder which one we chased around the Trollshaws in I.4. I don't recall his name; perhaps it wasn't specified. I seem to recall some quest in Mirkwood saying that the Lieutenant of Dol Guldur was the one we chased in the Trollshaws and defeated in the Misties? I don't remember for sure though. What I'd like to know is who's the one Legolas shot down by the Great River. We encounter the Nazgul that Legolas shot down in the Great River region when he injures Nona. I can't recall if he's named or generic, but since we only drive him away and shortly after in the Langhold quests we see a riderless Fell-Beast followed by being terrorized by said Fell-Beast with a rider, I always assumed they were the same Nazgul. Yes; I did that one yesterday and, darn it, by the time I looked up from setting the tower on fire he had flown off. Wouldn't have seen anything he said if it hadn't been in the chat log. You wouldn't think something that size would be able to take off that fast. Magic, I guess. As far as I know, we have no idea why he took the dunlending spirits. With yesterday's update, it looks like we've got another: The Cursed Rider. Though I'm gonna assume that this is actually the Witch King, but angmar isn't gonna exist for about a millennium. It looks like that within the High Elf introduction instance, all nine nazgul could be spotted with most of the names listed above. As I couldn't spot the Lieutenant of Dol Guldur/Khamul in the ranks, i can only assume that the Cursed Rider is in fact the lieutenent. Also as a side note, it seems they labeled the Witch King of Angmar as just the Witch King, probably because Angmar wasn't formed yet!